Thanks to those of you who said my parents are adorable. They really are quite swell if I do say so myself. We had a great weekend together. They left on Monday afternoon and Michael left that morning for a retreat, so what did I do? Well, after I was pouty for a bit, and shed a tear or two, I pulled myself together and made mac & cheese and popcorn and enjoyed it on the couch with the smalls while we watched some old episodes of The Pink Panther. It is a rainy day here. Nothing new with that as it has been raining since Sunday, with a bit of a break yesterday (not exactly great for a girl who is missing her family). However, the little bowl up there has brought me some sunshine. My parents just took a trip to St. Augustine. Yes, they went without me, which was a little bit difficult seeing hows I love that place so much. But, knowing me so well, my mama brought me some treats from my favorite city. The little dish came from one of our favorite shops. She used to sing that song to me all the time as a child and now I sing it to my smalls. She also got me a charm to go with the schoolhouse charm I got on our trip earlier this year. It is a charm of St. Augustine's city gates. Isn't it cute? Another thing that is bringing me sunshine on this otherwise rainy day is the fact that my sweetheart returns this afternoon. Yay for me! 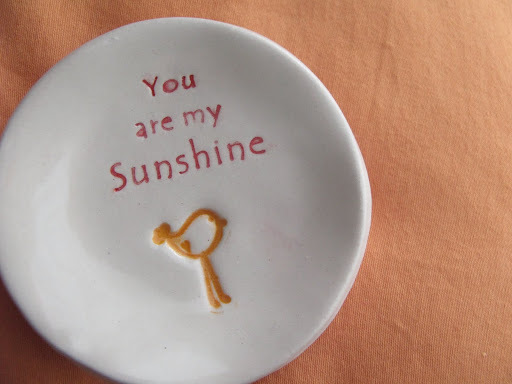 Very cute plate! Do you have a well filled charm bracelet? I had one going for a while, but haven't pulled it out in a long time. wish I could come share som pop corn with ya! that plate is too cute! that was so sweet of your mama!!! aww, that charm is adorable Amy! !